Feel the might of the dinos! 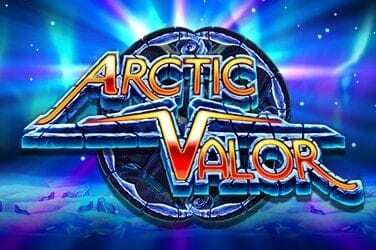 While that may sound like something you might here at a kids party before bouncy castle mayhem ensued, it is also quite possibly what the Microgaming execs shouted at the top of their lungs when this online slot was green lighted. It’s also what I shout whenever I score one of the 25 payline wins, but you don’t have to if you don’t want to. 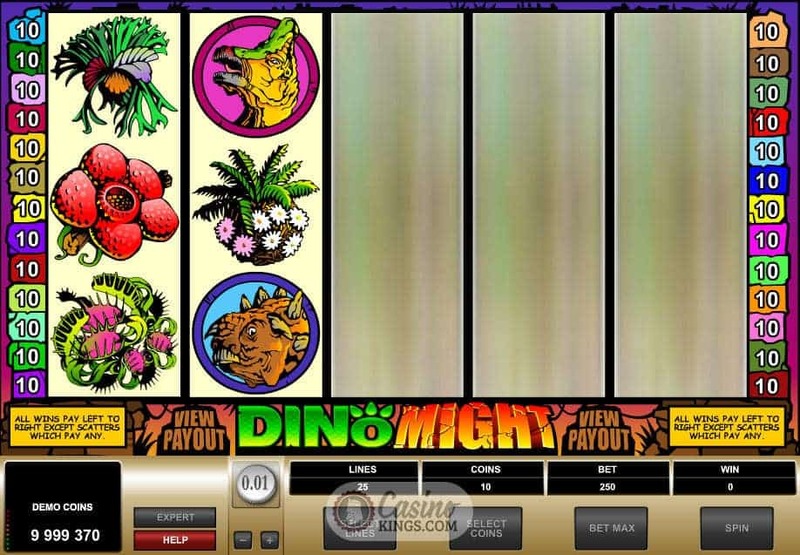 Dino Might is a coin-based game, meaning that all credits are converted to coins during play and converted back to credits when you want to exit the game and go spend your credits in the real world. Presumably on toy dinosaurs, or some sort of dinosaur-related paraphernalia. Dinosaurs may not have had coins when they ruled the earth, but boy are they making up for it now. 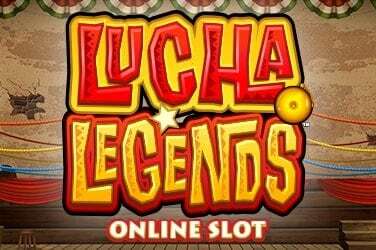 Played across 25 paylines, we choose our bet-per-line but also our coin bet – and any changes we make are reflected in our game wallet in real time. 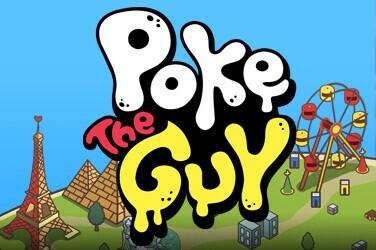 This game is stylish, resplendent with lush images of dinosaurs and exotic flora and fauna. 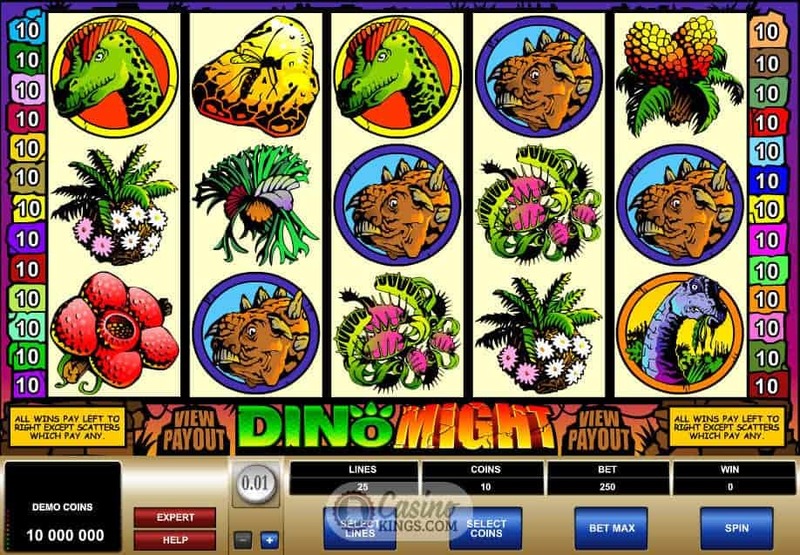 The soundtrack croaks and whistles to the sound of indigenous wildlife, while the dinos are well-drawn and the shivering Mosquito-In-Amber Fossil Scatter symbol is a nod to another dinosaur-themed game that Microgaming would go on to develop into a smash hit in the gaming world. Can anyone guess which one? 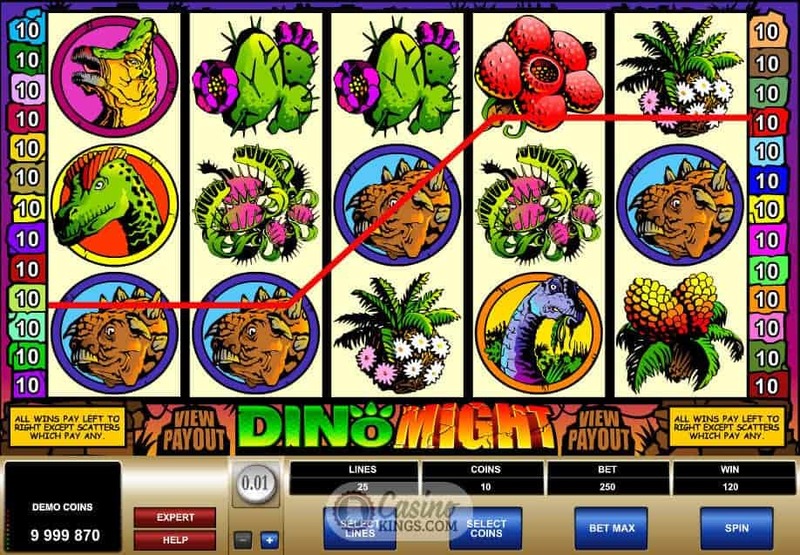 With the Dino Might Game Logo as this slot’s Wild symbol – doubling wins and substituting for all symbols except the Scatters – there is plenty on offer in the base game so to have two bonus features at our fingertips is a luxury the dinosaurs certainly weren’t afforded. Landing three or more Triggersauruses – not their real name – on a winning payline causes our dubiously-name dinos to explode into a gut-shivering roar and, err…trigger the Trigger Reel Bonus. We must pick one of these fearsome lizards to reveal a random spot prize up to 4,500 coins, at which point our Triggersauruses return to being seemingly docile and innocuous. 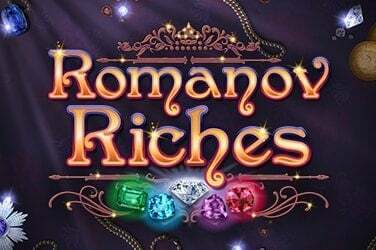 The game’s main bonus feature is the Match Bonus, launched when we land three or more Amber Fossils scattered across the reels. 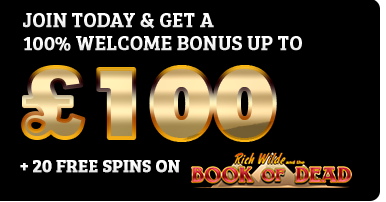 We must match four of the same symbols to win up to 20,000 coins, plus a Mighty Multiplier to boost our winnings past the ice age and into a dinosaur-filled theme park. Oh no, that’s another slot altogether. With two bonus features plus base game Wild wins this title is one not to skip over. 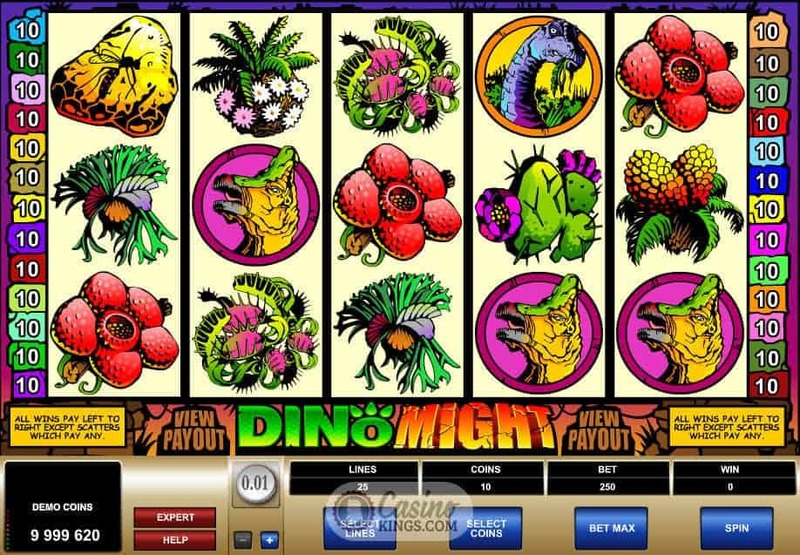 Microgaming’s other famous dinosaur effort – for we all know it’s name – will doubtless remain the favourite if only for the suped-up graphics that modern gaming technology can deliver. However, this title has plenty going for it, which is perhaps why Microgaming got the Jurassic Park gig in the first place.